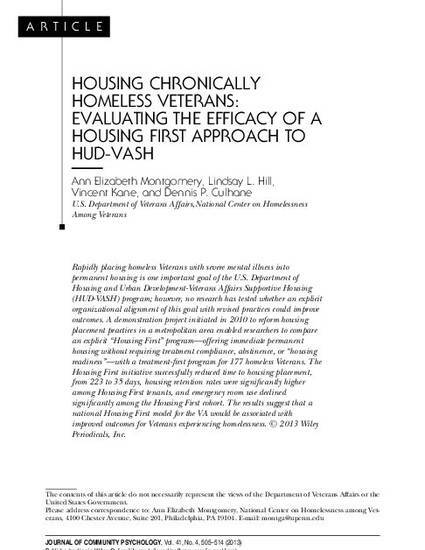 Rapidly placing homeless Veterans with severe mental illness into permanent housing is one important goal of the U.S. Department of Housing and Urban Development-Veterans Affairs Supportive Housing (HUD-VASH) program; however, no research has tested whether an explicit organizational alignment of this goal with revised practices could improve outcomes. A demonstration project initiated in 2010 to reform housing placement practices in a metropolitan area enabled researchers to compare an explicit “Housing First” program—offering immediate permanent housing without requiring treatment compliance, abstinence, or “housing readiness”—with a treatment-first program for 177 homeless Veterans. The Housing First initiative successfully reduced time to housing placement, from 223 to 35 days, housing retention rates were significantly higher among Housing First tenants, and emergency room use declined significantly among the Housing First cohort. The results suggest that a national Housing First model for the VA would be associated with improved outcomes for Veterans experiencing homelessness.